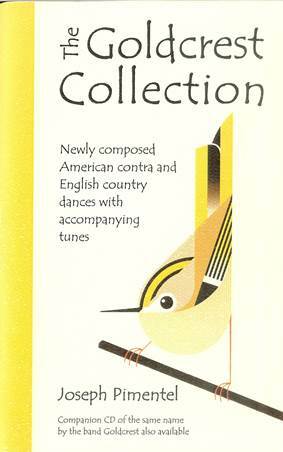 The Goldcrest Collection with accompanying booklet is finally out! You can read the liner notes here, and you can order the CD and the booklet from Joseph Pimentel here. You can listen to samples and order tracks from cdbaby. Three seasoned musicians of national reputation and steeped in the folk dance traditions of Appalachia, New England, and the British Isles come together to form the band Goldcrest. 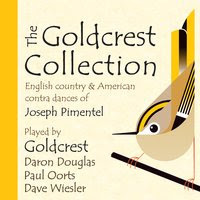 Named for a British songbird with close relatives in the Americas, Goldcrest features fiddler Daron Douglas, pianist Dave Wiesler, and multi-instrumentalist Paul Oorts in a trio producing country dance music of exceptional quality and unsurpassed variety. Daron Douglas combines the precision and tone of a classical violinist with the energy and soul of an Appalachian fiddler. She grew up in the Appalachian hills, learning traditional ballads from her grandmother and studying classical music through college. Daron has been on the staff of numerous CDSS dance camps and at the John C. Campbell Folk School in Brasstown, NC. Daron also plays with dance bands Foxfire and Misbehavin', with pit orchestras, and with blues bands. She now lives and plays music in New Orleans. Paul Oorts is much in demand on the dance circuit for his driving world rhythms, improvisations and stylistic versatility. Paul plays an astonishing array of instruments, including mandolin, tenor and five-string banjos, cittern, musette accordion, dulcimers, and guitars in many different tunings and styles. A native of Belgium, he is well versed in Flemish and continental European music and performs regularly with his wife, flutist and dulcimist Karen Ashbrook. Paul also founded, conducts, and arranges music for Carillon, a hammered dulcimer orchestra. His recordings include Celtic Café with Karen Ashbrook, Momentum with Steve Schneider, and numerous appearances on albums released by the Azalea City label. Dave Wiesler has built a national reputation for his rhythmic and innovative piano playing. At home in a huge range of styles, Dave plays for concerts and dances of many sorts: contra, swing, vintage, couple dance, English and Scottish country dance, Viennese waltz. He has performed at the Kennedy Center, the Washington Folk-Life Festival, the Honolulu Academy of Arts, and the Smithsonian Museum, and he has played at festivals and dance camps across the country as well as in Canada, Scotland, and England. Dave has played on over a dozen recordings, many featuring tunes and songs he wrote, and he is also a capable guitarist and singer. Some of his other bands include Laura and the Lava Lamps, Cabaret Sauvignon, The Avant Gardeners, The Gigmeisters, Green Light Karma, and Thistle House. Dave presently lives in Newark, DE, and is a stay-home dad of two young boys. Here's a video of an improptu concert we played in New Mexico at FOLKMADS. It gives a good idea of the improvised, rambunctious, Dionysian approach to English dance that typifies this band. (We've never ever rehearsed!) Too bad Daron is hidden behind that music stand all the time. Here's a link to a more recent impromptu recording of Goldcrest playing for the Friday Night dance at Glen Echo.